The International Continental Scientific Drilling Program*1 will start "Scientific Drilling in the Samail Ophiolite, Sultanate of Oman" from December 1, 2016. Formed in the Late Cretaceous, the Samail Ophiolite in Oman is a block of oceanic crust and upper mantle that was thrusted onto the Arabian continent ~100 million years ago. It represents the Earth's largest mass of exposed ancient oceanic crust and mantle rocks on land; however, the weathered surface layer limits available information. 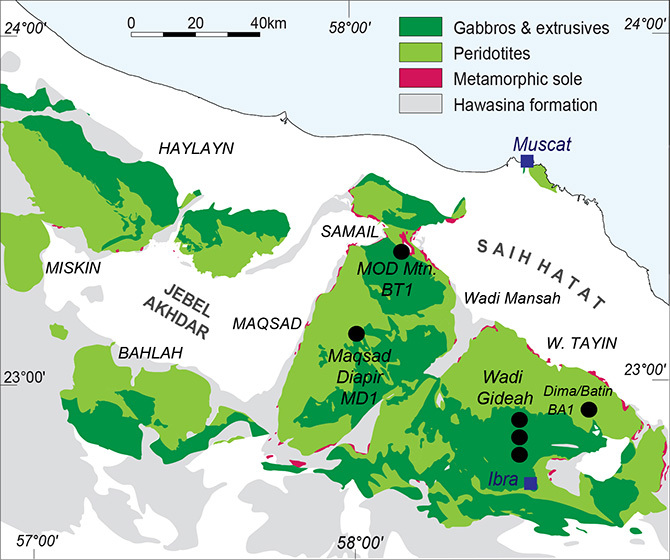 To explore the oceanic crust and upper mantle, this scientific drilling will carry out 15 drilling operations at six sites in the southern part of the Samail Ophiolite. Samples from fresh rocks and groundwater will be collected with logging and monitoring. In cooperation with the International Ocean Discovery Program*2, these drilled samples will be analyzed in up-to-date laboratory facilities on the D/V Chikyu in summer 2017. Based on these data, scientists will address unsolved issues such as the relationship between the core-mantle boundary and Mohorovičić discontinuity, the process of oceanic plate formation and hydrothermal alteration, and weathering in mantle peridotite, together with the subsurface biosphere fueled by microbial catalysis. A total of 50 participants include 25 scientists with graduate and post-doctoral students from JAMSTEC, Niigata University, Shizuoka University and Kanazawa University, along with those from the U.S. and Europe. This scientific drilling is supported by JSPS KAKENHI Grant Numbers, JP16H02742 and JP16H0634. *1 The International Continental Scientific Drilling Program (ICDP) is a multi-national continental drilling program launched in February 1996 at the initiative of the U.S., China and Germany. Japan joined in 1998. It is promoting continental drilling programs by setting three societal challenges: Climate and Ecosystems; Sustainable Georesources and Natural Hazards. JAMSTEC is representing Japan with Japan Drilling Earth Science Consortium (J-DESC) *3 as contact office. *2 The International Ocean Discovery Program (IODP) is a multinational cooperative project that started in October 2013.The scientific drilling vessel D/V Chikyu, operated by Japan, and the JOIDES Resolution, operated by the U.S., are utilized for expeditions. There is also an option to charter mission-specific platforms from European countries. The mission of the IODP is to shed light on global environmental changes, the earth’s mantle and crustal dynamics and tectonics, and the biosphere beneath the seafloor. *3 The Japan Drilling Earth Science Consortium (J-DESC) was established at initiatives by Japanese universities and research institutions in 2003. It serves as the Japanese office for the international cooperative scientific drilling programs, IODP (International Ocean Discovery Program) and ICDP (International Continental Scientific Drilling Program). Figure 1: The Samail Ophiolite in Oman. The black circles indicate drilling sites. The project will drill the crust, mantle and moho surface to obtain continuous data.